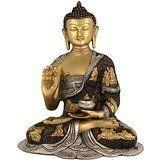 This beautiful & Rare antique Buddha statue is of brass material. This masterpiece depicts Buddha Shakyamuni in the Medicine Mudra. This Gorgeous Large Buddha statue has detailed Handwork . Very unique & Beautiful collection with great quality Buddha In Vitarka Mudra : Sitting Buddha peacefully, Right hand of the buddha is in Vitarka Mudra and left hand in the lap. Thumb and middle finger touched forming a circle. Material : Solid Brass with Detailed Handwork Size : 12 Inches Tall X 9 Inches Length X 6 Inches Depth. Weight : 5 Kg -------------- Pls beware from Copy product & ensure buying authentic product. This is exclusive product of Brand " Collectible India" and "covered by intellectual property rights laws". 'Collectible India' do not authorize any other Brand/Seller to sell it and won't be responsible if any copy or substandard product send by any other seller.